Are you looking for a great last minute Christmas present for that special little boy? If so, in my opinion I have the perfect gift idea for you ! Dinosaurs...what little boy does not LOVE them? I know my son absolutely adores them. When I had the chance to review Monty Rex from Playskool, I could not pass it up! Monty Rex stands over 14 inches tall, moves his head, tail and arms and he walks! When he arrived I was excited to get him out his package and see my toddlers response. To no ones surprise he LOVED him !! Soft and snuggly, this prehistoric pet responds to your touch with lifelike movements and sound! Unleash him from his box and he’s ready to walk! Touch his back and he’ll stomp, roar and purr his way into your heart! Moving his arms and head -- just like a real dino! – this mischievous MONTY REX dinosaur pet sniffs and sneezes too! Wanna “rock” out like they did in the Stone Age? This cuddly creature plays three rockin’ dino tunes! And when it’s time to “feed” him, he even chomps! Your prehistoric playmate even comes with a discovery sheet to help you learn a few interesting facts about your new friend! 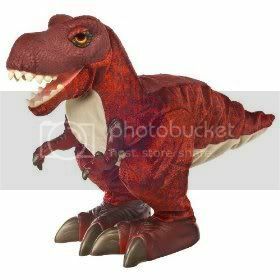 Monty stands at around 14" tall and moves just as one would expect a real T-Rex to move. Monty Rex is a reddish brown color. His skin is soft to the touch, made of a very thin material. His feet, teeth and inner mouth are all a hard plastic. His arms are a softer, plastic material. His battery pack is located between his legs. When you open him, be sure to change him from “Try Me” to “On”. Monty Rex would make a wonderful "Santa" gift for any little one. He is recommended for ages 3 and up! 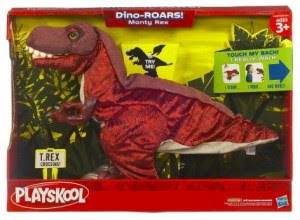 Monty Rex Dino: This dinosaur friend would be a hit this Christmas! It requires three C batteries and retails for $69.99. I’ve seen it on sale for cheaper, though. We have one of these and he's so cool. I just wish they made other "models" and types of dinos. Paige would LOVE Monty Rex. She didn't get him for Christmas, but maybe Valentine's Day. This would be perfect for our grandson's birthday in June! He'll be 3 and he loves dinosaurs, thanks! I love how tall and detailed he looks! My son would love this. He is a Dinosaur Fiend! LOL I love that it is partially soft. Not just a huge hard plastic dinosaur! I bought one of these for my grandson this past Christmas and he loves it.